If you have been an Adam Sandler fan for any length of time you have come to expect certain things from his films. They usually feature tons of cameos, a ridiculous premise, fart jokes, and in the middle of it all is our level headed protagonist that looks, talks, and acts like Mr. Sandler. It has been obvious since about "Mr. Deeds" that Sandler no longer had to really try in order to bring in the crowds and meet the box office goals. He lumbered through film after film while occasionally putting in the extra effort to be ridiculous (I am one of the few who really enjoyed "Don't Mess With the Zohan") but it was his side projects that really showed what a flourishing career he could have if he looked outside his Happy Madison production company. 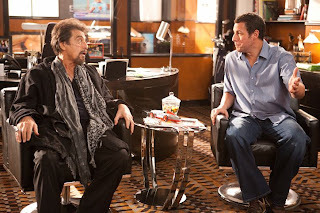 Whether it be "Punch Drunk Love", "Reign Over Me", or the one that applies best to examining Sandler's current situation, "Funny People" (I don't care for "Spanglish") it showed a Sandler that could really act if he wanted to, a Sandler that given good material and innovative people to work with he might actually leave a legacy as a credible comedian and not the farcical joke of a comic actor he has become today. With "Jack and Jill" though Sandler continues to cement himself as a one note kinda guy that doesn't mind going for the cheap laughs, enlisting his buddies in every film and in this case, dressing like a woman to play his main characters twin sister. If you go see this, you can't be mad because it delivers everything you expect it to, and the fact is most people won't. This is exactly what they are hoping for. The one thing you can give "Jack and Jill" that separates it from Sandler's last two outings, "Grown Ups" and "Just Go With It" is the fact Sandler actually does something other than play himself. The guy deserves props for dressing up like a woman (though it looks like it didn't take much as many jokes are made about Jill's masculinity) and trying to pull a Robin Williams a la Mrs. Doubtfire, but the sparks dull as soon as we get to know Jill and learn everything her brother has said about her is actually true. Jill is a loud, lonely woman from the Bronx who loves her brother dearly, if not a little too much, but knows how to push buttons and overstays her welcome. Jack (regular Sandler) works at an advertising company in LA (oh, how convenient) and has a beautiful wife (Katie Holmes this time) and two children one of which is adopted and enjoys tape so much he gets a running gag of having different objects taped to his body. The wife, the children, they don't really matter though. All the film really cares to focus on is all the damage Jill does in trying to fit in and find a man. The focus doesn't even stay close to the brother/sister relationship that gives the film its title. We see Jack trying to get what he wants by using his sister and Jill playing oblivious to her actions trying to find a family so she doesn't have to bother her brother every year. In a twist that makes you wonder if this is even real, Al Pacino makes an extended cameo as himself who immediately falls for Jill and also happens to be Jack's ticket to saving his ad company (oh, how convenient). 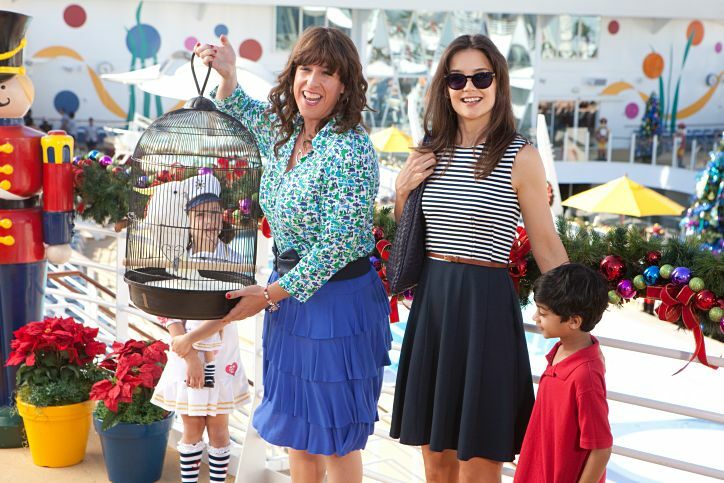 excited for the on set vacation, I mean cruise scene. I hate to sit here and write this even because we all know critics will and do hate "Jack and Jill" but that folks will still turn up to see it. In its opening weekend it came in second place with $25 million and will no doubt continue to do well throughout the holiday season as it is marketed as a PG-rated family film. In the theater I saw the film it was more crowded with families and young children rather than teenage boys or younger adults which I for some reason still expected to show up to Sandler comedies. What is interesting still is that no matter what the topic or premise for one of his "comedies" turns out to be I always seem to be going back to the fact that the man is now a parody of himself. That he truly has become the George Simmons character of "Funny People" but without the incentive of a life threatening disease to make him stop and take a look at what he has become. Sandler no longer seems interested in genuinely making an audience laugh or raging against the movie factory machine, no, instead he has become an integral part of it. It is as if after "Funny People" a film where he had to put in long days, and dig deep into the psyche of his character to get to that place where the thought of death was immanent, he became exhausted by the effort it took to pull off and has since resorted back to his safe zone. A place where he can slum through a role, get all his friends a paying gig, and still make plenty of money. Actually, he makes more money by doing what he is doing, "Little Nicky" is his lowest grossing film and probably considered his most awful critically as well and it still made more than "Punch Drunk Love" and "Reign Over Me" combined. There is no incentive to face what he has become, but this is surely incentive to continue the trend he has now perfected. Dunkin Donuts in which Pacino appears. 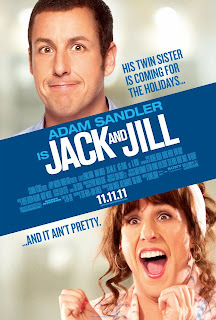 Sorry to stray so far from the film at hand, but in seeing a move like "Jack and Jill" as compared to his earlier juvenile comedies it makes me yearn for that kind of Sandler if not one that has matured into something more than what we are currently seeing. We all know he has it in him, we have seen it, but Sandler faces a rare circumstance where the easier road is the more fortunate one (in terms of money anyway) and he has chosen that road. There is no reason to even comment on how mediocre or bad "Jack and Jill" really is because you have already heard that a million times if you read film reviews. To be honest with you, it has a few good laughs; the best coming when Sandler himself seems to just improvise on the fly and we see that spark of imagination trying to sneak its way in. Sure, there are plenty of stereotypical religious and racial slurs and more than enough fart and poop jokes, but the movie is more than tolerable and simply playing spot the celebrity in this movie would make it more fun. Why Al Pacino agreed to do this I will probably never understand, I mean the guy has been in bad movies before, but he knew what he was getting into here going in. Oh, and a bonus: Pacino raps! Which is swiftly followed by a scene where he says "No one can ever see this." I sometimes wonder how Sandler doesn't say that about some of his own films, but no matter, there is no escaping them. Let's just hope his pairing with Andy Samberg in this summer's "Donny's Boy" will prove a stimulating experience that might help him step back and see not only how far he has come, but what he has become. Fingers crossed.